Undeserving of such a short lifespan, Dreamcast has continued to play home to the occasional independent development. One such game is Senile Team's Rush Rush Rally Racing (R4). Originally created as an entry for a Dreamcast programming contest back in 2009, the team adapted its work so that it was fit for release on WiiWare. 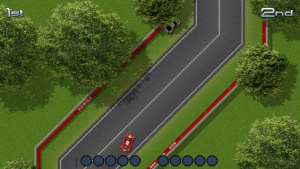 It's a good job it did, as beneath its 16-bit-style retro visuals lies a challenging take on the top-down racer, with tight controls that soon have you skidding around corners at hundreds of kilometres per hour. Its modes are relatively few – grand prix, challenge mode and the ever-present time attack – but each is fairly content-rich and bound to last you a while. Even on the easiest setting Rush Rush Rally Racing refuses to roll over without a rev, and you'll need iron thumbs to get into the right gear for 'insane' difficulty. If the Wii Remote's little D-pad is giving you a hard time, you can pop in a Classic or GameCube controller instead. Grand prix takes you on a journey through 10 tracks played one after the other. You only qualify for the next course if you finish in the top three – and you've only got a couple of credits to retry should you fail. The other drivers are unforgiving, paired happily with tracks that feature frequent sharp turns, so getting through this mode is no easy ride. Though there are some traditional race courses, this is not your typical grand prix set up. You also drive through deserts and cities, where the tracks often veer off the tarmac and over alternate routes, such as dirt tracks or through underground passes. Make sure you keep your helmet screwed on as there are few straightforward tracks, though directions do flash up on screen to warn you which way to turn and keep you on course: the thrill of night time races and unconventional, air-hurling ramps further mix things up. There are shortcuts in many of the courses, but it can sometimes be difficult to determine when it's acceptable to use them; inconsistently, some tracks will punish and disallow a lap for wrong turns, while others let you slip through and get away with it. You're actually encouraged to go skidding off-route from time to time, as there are secret vehicles hidden around the areas: discover them and you'll be able to play with the likes of bulldozers in multiplayer. They're not easy to spot at all, and you're more likely to run into – quite literally – other roadside 'attractions' such as pedestrians and cattle, complete with yelps and messy splats across the ground as you collide into them. 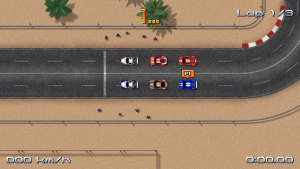 Think 2D top-down Grand Theft Auto. 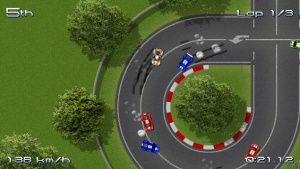 Further courses can be found in challenge mode, in which you take on several characters head-to-head and try to race them off the screen by getting as far ahead as possible; first to five points wins, one scored for every time they're left in the dust. The opponents are tough, their in-built knowledge of each track perhaps a little too obvious. The faster you go, the closer to the edge of the screen you get, making it more difficult to see where you're going – so you'd better learn those routes quickly. 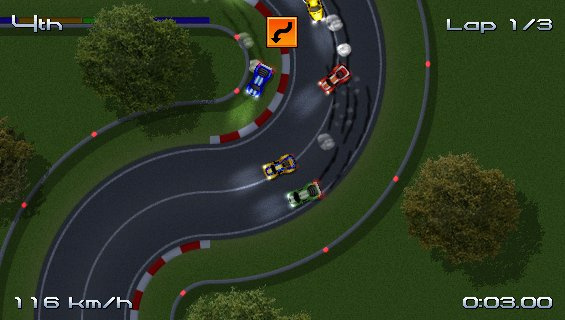 Time attack lets you test yourself in all 19 of Rush Rush Rally Racing's courses, which is useful given that you might only get to later grand prix stages a handful of times initially. Your best lap on each course is represented by a ghost car, giving you something tangible to compare your current performance to. Both challenge mode and time attack are newly developed for the WiiWare edition, the lack of the latter being one of the main criticisms when it was released on Dreamcast. A local multiplayer mode for up to four players rounds R4 off. There are standard split-screen races, a multiplayer version of the score-based challenge mode (for two players only), and item races where you can use boosts, oil slicks and machine guns to gain an unfair advantage over others. It's a shame there's no online functionality to be seen; it would have been good to see leaderboards for time attacks at least. 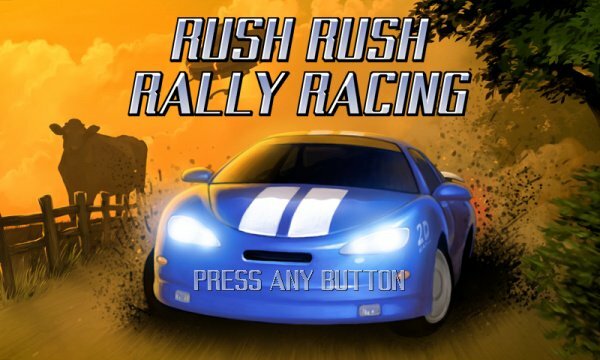 Rush Rush Rally Racing's visuals are a shock when you first boot up – they look like they could have popped out of a Mega Drive upon first glance. Delve deeper and you'll discover night stages and transparent lighting that would have caused the system trouble, though, and before the first race is even halfway through it doesn't matter – they're very appealing in their own, chunky 16-bit way. The audio is a constant delight with a soundtrack that reminds of 90s SEGA mixed with the same era's dance music. The most pleasant surprise is its fidelity – with its low visual requirements a fair bit of space must have been saved, and from the sounds of it anything spare went right back into the audio. Each piece of music and sound effect is delivered with fantastic clarity, and we've caught ourselves humming the tunes away from the game more than once. There's a reason that a soundtrack CD was bundled with the Dreamcast release. Senile Team has clearly put a lot of effort into revamping its game for WiiWare, and it pays off. 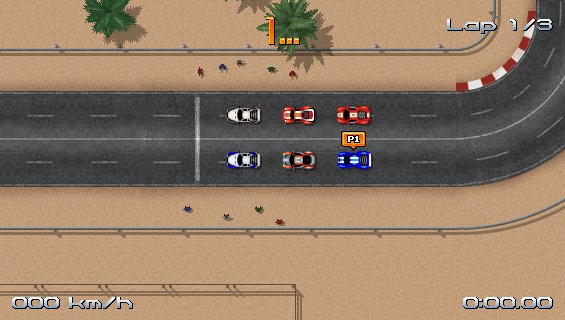 Rush Rush Rally Racing is an addictive, tightly-controlled retro racer that paints its inspirations brightly on its bonnet. It might look feature-light, but there's more than enough to keep your engine running if you want to beat and find everything on each difficulty setting. Hmm yes, I will take it. Expected it to be shovelware. Since, you know, most WiiWare games are shovelware. Just picked up TNT Racers last week, and it's been good multiplayer fun (though light on tracks). Good games deserve support, and being on WiiWare instead of the 3DS eShop, I think the developers are not likely to see a return on all their hard work . We need more people buying WiiWare games, especially the good ones! I'd love to know more about multiplayer (since that is how I usually play). Definitely sounds fun . I was thinking about buying the Dreamcast version, but I'll wait and see if the WiiWare version comes to the USA. @cyrus_zuo What would you like to know about the multiplayer? I've got / reviewed TNT Racers too, so any comparisons you want... I personally preferred this to TNT from a single player perspective. TNT has the advantage of online multiplayer — this is local only — but unfortunately I could never actually find anybody playing online. @HeroOfWaffles Correction: Most Wiiware games these days are shovelware. Before 2011, this was not the case. Well, if there's mentioning of Dreamcast games, I can't help but think of how awesome Armada would be on 3DS!! I'd love to buy this as soon as it's available in America, but NOA seems to be not very interested in supporting the Wii and Wiiware platforms any longer so who knows if/when that's gonna happen. Got the game today. It's really fast and lots of fun in multi. 19 tracks, 3 soloplayer modes, 3 multiplayer modes, 4 difficulties, 21 achievements, 6 endings, 319 blocks, 900 points. And I don't know how many hidden vehicles. Grand Prix is 10 races in a row with just 3 credits. I beat it on EASY but that ones going to be tough on the higher difficulties. Pretty retro old-school. So far 8/10 seems reasonable. But I don't like how BACK is attached to the minus button instead to the 1 button. And I can't read the lines on the bottom of the screen. They're cut half off. Wow, this looks a lot better than I expected. Awesome review, Mike! Finally! I was afraid all developers had forgotten that GameCube controllers are compatable with the Wii. I'll pick this up eventually after it hits North America. 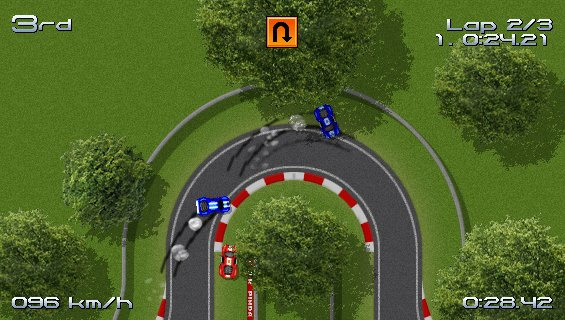 This game is great fun and I'm not even a racing fan. I'd maybe have given it a 9 myself. The screenshots make this look like a cross between Micro Machines and the original Grand Theft Auto. Looks ace and sounds like a lot of fun... 900pts seems like a steal!